In search of a sweet spot for full connectivity? End your search now. 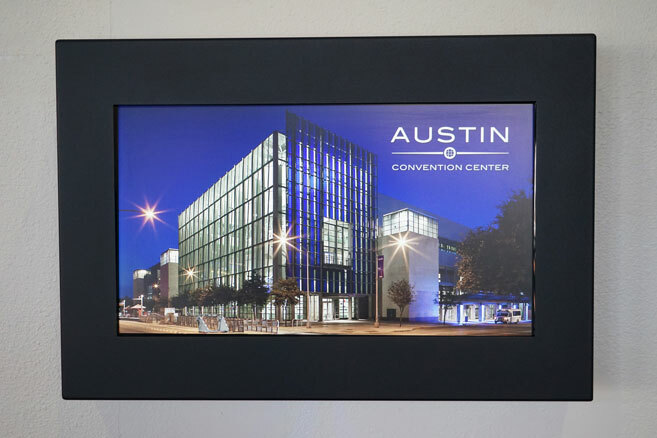 The Austin Convention Center is the oasis you’ve been looking for this whole time. Complimentary Wi-Fi or purchased hard lines, we’ve got you covered as the exclusive provider for internet and technical services at the Convention Center. Coupled with a knowledgeable team of IT professionals up to date on the latest technology, you can expect an enjoyable experience wherever you are in the venue. 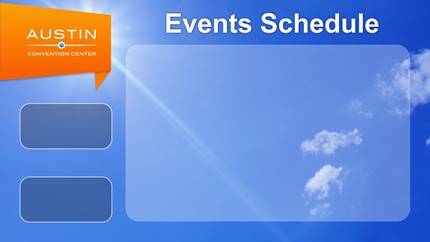 Our team is ready to provide expert assistance to any networking needs you may have during your event. With constant network monitoring, we can quickly solve issues that come up, and proactively address areas of concern. Robust, complimentary Wi-Fi (3 Mbps up/down per device) covers 100 percent of our venue. Thanks to our high-density Cisco wireless environment, we can connect 20,000 wireless devices at one time. 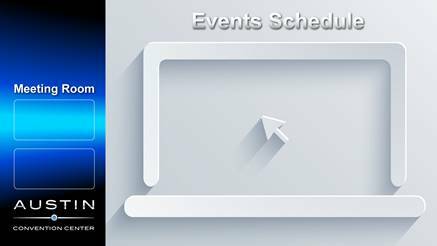 Along with coverage all throughout the venue, our team can dedicate 2 Gbps of bandwidth with an ability to increase for your event. This capability allows us to respond to surging demand seamlessly, without a hiccup for you. The venue is souped up further with Distributed Antenna Systems for AT&T, T-Mobile, and Verizon to maintain reliable cellular service on our premises. Our team can engineer a flexible network with plug-and-play capabilities designed to scale for your event. For mission-critical purposes, such as live presentations, we recommend using hard lines for max performance. The hard lines access 2 Gbps of bandwidth with the capability to burst to 10 Gbps. This action occurs within a redundant Cisco Enterprise ethernet infrastructure built upon a 10 Gigabit backbone. To purchase hard lines, please visit our Online Ordering portal. Share your content all around the venue. Inside and outside highlight event details, logos, and sponsorship information with this complimentary service. Using the Four Winds Interactive system, push content (without audio) in batches or independently from one another to the appropriate screens. Submissions for digital signage should be delivered at least two weeks prior to your first contract day to avoid technical labor charges. NOTE: All presentation materials must be submitted a minimum of two weeks in advance of your first contract day. Late submissions will incur technical labor charges per our fee schedule ($150 per hour). If a Preferred font is use specifically for your logo, please convert fonts to Outlines, as we may not have all fonts available. The LED exterior marquees have limited resolution capabilities, which are not suitable for every graphic display type. 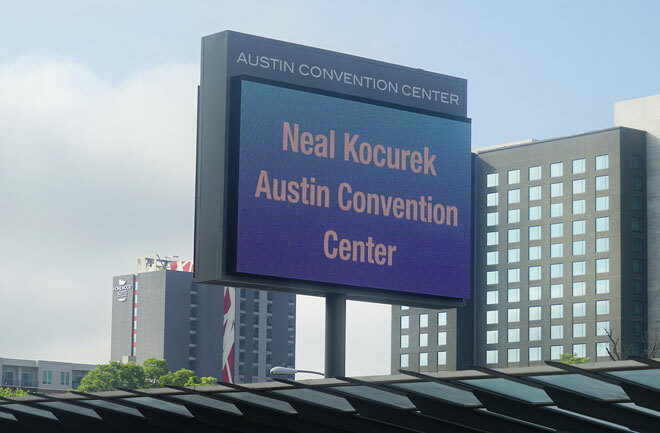 Keep in mind, the marquees are in sunlight and this can affect the legibility. White backgrounds are highly inadvisable. Highly detailed graphics with intricate shapes may lose shape/readability. Graphics must be submitted within exact pixel dimensions for each of the two (2) marquee dimension sizes. We cannot resize flattened (rasterized) graphics to fit without significant distortion and/or image loss. Send graphics to accddigitalbiz@austintexas.gov for testing and reviewing. Our team will send an email confirmation once your content has been scheduled or if we have additional questions. 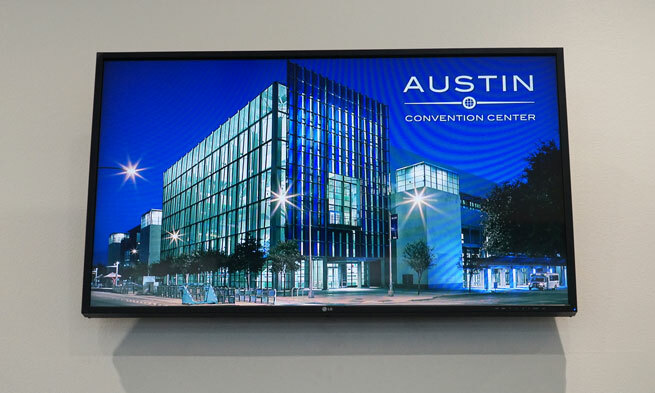 Programming Policy: It is the policy of the Austin Convention Center that these screens will not be dedicated to any single client for exclusive usage, as events for multiple clients may run simultaneously in-house. 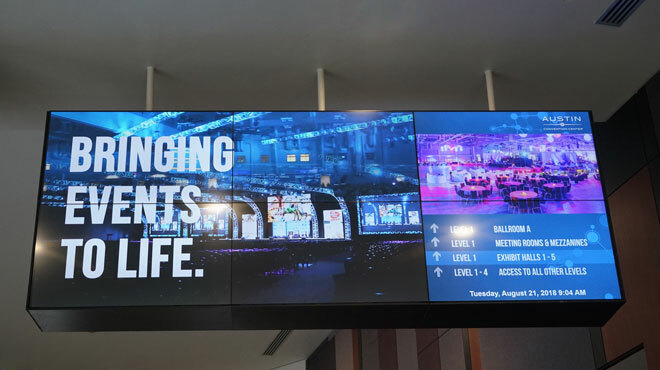 Screens will be used primarily for client content and wayfinding, to run concurrently with ACCD promotional programming such as amenities and catering services. There are three large format displays located at the Center. One double-sided screen is located outside of Ballroom A. A third screen is on level four north just across from the fourth street escalators. 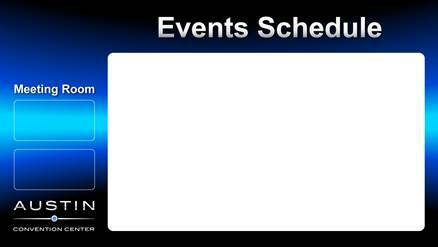 Clients send event content/graphics to ACCD IT for review, test and deployment. Please email accddigitalbiz@austintexas.gov if you are using another format. Templates Available: Let us know via email (see How to Submit below) which template you prefer. Send the template and images (in JPEG format) to accddigitalbiz@austintexas.gov for testing and reviewing. Consolidating multiple movie files of shorter duration into a single movie file is highly recommended. This is far less taxing on the build and ensures successful long-term performance. For additional questions, please email: accddigitalbiz@austintexas.gov.